Beautiful Days is the second in the Bright Young Things series. While I enjoyed the first book I thought this instalment was much more engaging and I enjoyed it all the more for it. This book picks up where the first one left of and continues to follow the stories of the three main girls and all the different things they go off and do. 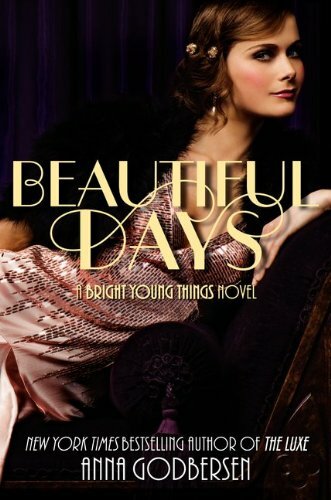 I love how the book entertains the reader by following these girls and at the same time gives them a real insight and feel of the time it is set in complete with all the glitz, glamour and danger that surrounded the mob gangs and speakeasies of 1920s America. I loved seeing how each of the characters progressed and changed as the book went on. I loved the storyline with Astrid as you see her adjust from party girl to housewife. I loved seeing how she was torn being the two different roles and found some of her scenes to be the funniest in the book especially the one where she attempted to cook for Charlie. Cordelia comes into her own in this book taking her place in the Grey family and helping to run the newest club in town whilst being the centre of attention in the gossip columns. Letty's story in this is also brilliant and a bit of a roller coaster ride as we see her battling on to achieve her ambition to be on Broadway. As with the first book there are sections where the story goes along quite slowly giving the reader time to get to know the characters well but when the action does finally kick of you find yourself glued to every word and needing to know what is going to happen next. All in all a fantastic sequel to a cracking series which I am continuing to enjoy. Counting down to book three already. So glad to hear this is good. I want this one badly! Great review. I really want to prove this series! I'm looking forward to this one, but I haven't gotten the first book yet, whoops!